In light of recent shootings and increased violence this year, our second annual Peace N The Hood 3-on-3 basketball tournament was even more important than usual. 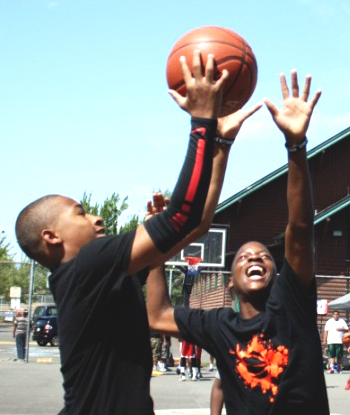 On a hot summer day, kids from different neighborhoods and walks of life showed up ready to play ball and spread the message of “Increase The Peace” throughout the White Center community. The outdoor courts were covered in “Peace Boards:” big signs with pictures and hand-drawn messages like “No violence,” “Keep the Peace,” and a gun crossed out. Youth received official Peace N The Hood shirts, and afterward, they made their way to sign the banner which read “I pledge to be violence free.” Friendly (yet intense) competition continued throughout the day, and youth also got to grab burgers from the grill, visit resource tables, and meet Seattle’s own Jamal Crawford, a Rainier Beach HS alumnus and a current NBA Player for the LA Clippers. The day ended with trophies for the winning teams, prize drawings, and youth leaving with the message to Increase the Peace in The Hood. All of this wouldn’t have been possible without collaborative agency partnerships, and the diligent hard work of the Youth Planning Committee Team – ten youth who met twice a week for a month before the event. The youth planned and created the materials for the event and canvassed the neighborhood passing out flyers. They were visible with their badges and black t-shirts, handling refreshments, registration, photos, and clean-up. These youth accomplished their goal of continuing the tradition of the event and spreading peace in the neighborhood.